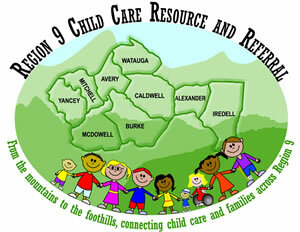 Child Care Resource and Referral (CCR&R) is a Region 9 based resource and referral activity. The primary goal is to link families with child care options in their area and help providers have the best programs possible. Region 9 provides free referral services to families looking for child care. They never recommend a program or provider, nor do they license them, they only make referrals. All legally operating child care providers are eligible to list with Region 9. Services and policies are unbiased and available to all people regardless of race, national origin, religion, age, gender, disability or political affiliation. Referrals are made to all programs (within an area agreed upon with the parent) and are under no form of investigation with the state of North Carolina. Region 9 referral service is available Monday through Friday 8:00 a.m. until 5:00 p.m. with voice mail after hours. The information is simple and confidential. CCR&R will provide factual information for families. It is up to families to visit programs or providers to find the best possible care for their child. CCR&R can describe what quality care should be and find sources for financial or other needed services. Families will be asked to complete a follow-up questionnaire and will receive a phone call to find out if care was found. Families are encouraged to keep up-to-date with the program they choose and report to us any feedback they want to share. If care is not found, we will look at the situation again and find new referrals.